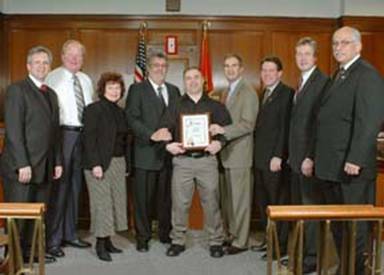 On Monday, January 22, 2007, Legislator Francis X. Becker and other Nassau County Legislators bestowed a Citation for Heroism upon Franklin Square resident, Daniel Fitzpatrick, for his courageous actions which saved a woman's life. While traveling home from an EMT training class, Mr. Fitzpatrick, a New York City Fire Department Emergency Medical Technician, was on the subway platform at Flushing Avenue in Brooklyn on January 11, 2007 when he noticed that a woman on the platform appeared distraught and disoriented. Mr. Fitzpatrick began talking to the woman with the hopes of calming her down. However, as the next train approached the station, the woman began to move toward the tracks with the intent to jump in front of the train. Concerned for the woman's safety, Mr. Fitzpatrick dashed after the woman and pinned her down as the train passed through the station as stunned subway passengers looked on. Legislator Becker is very proud of Mr. Fitzpatrick and applauds his fearless actions. Says Legislator Becker, "Mr. Fitzpatrick exemplifies all that is good in Nassau County."